Very quaint relaxed atmosphere in a chill corner of Barranco that is still very conveniently located. Easy access to the beach and sunset at night. 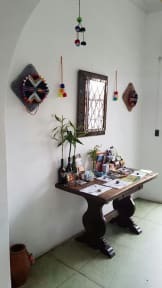 Great hostel in beautiful Barranco! Fantastically beautiful place with wonderfully helpful staff! I have stayed here twice now and it just keeps getting better and better! Do the free walking tour! The staff was super helpful and i felt extremely safe at and around the Hostel. the facility was clean and welcoming. i was even able to leave my bags at the hostel while i toured the city before my bus. I'd definitely recommend this hostel to anyone! 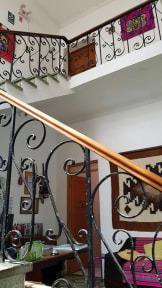 Nice hostel in a really central location in Barranco. Friendly staff and clean rooms. Amazing art-deco building, private room overlooking the sea is amazing value. Somewhat noisy, especially with windows open, but altogether an amazing spot in an amazing neighborhood. Hostel is clean, and is quite pretty. Included breakfast is a bread roll and a banana. The showers were hot and the pressure good. Our room was noisy, though. It was at street level and you could hear dogs barking, cars, and people talking as they walked by all night. It was also fairly light in the room because of a window above the door and an outside light right outside the window.